Smith & Bradley make some very fine, but rugged and affordable timepieces and they are pros at crowdfunding, having fully funded 2 previous watch projects on Kickstarter. Their latest project is the Ambush, a digital/analog hybrid watch with a drool worthy feature set. The Ambush features both digital and analog displays on the same face. This provides the obvious benefit of being able to track 2 time zones at once. The blue backlit digital display also allows more accurate readings of the time and chronograph feature along with an alarm function. Like previous Smith & Bradley offerings, the case is machined from 316L stainless steel for corrosion resistance and durability. The case is PVD coated to a deep black color. The case is topped off with a AR (anti-reflective) coated sapphire crystal. That case and scratch resistant crystal are wrapped around a Swiss movement which is typical for Smith & Bradley watches. Smith & Bradley is known for their lume. They use Superluminova to create a watch face that is readable in low light with long lasting glow but without the “look at me!” glow that some tritium watches generate. The slickest feature of the Ambush is probably the electronic compass. It is adjustable for heading and declination. When the compass is activated, the minute hand shows true north, the hour hand indicates your heading, and the digital readout shows your direction and heading in degrees! Smith & Bradley watches are not inexpensive but they are a good value. They are an even better value when you get on board early in the crowdfunding process. 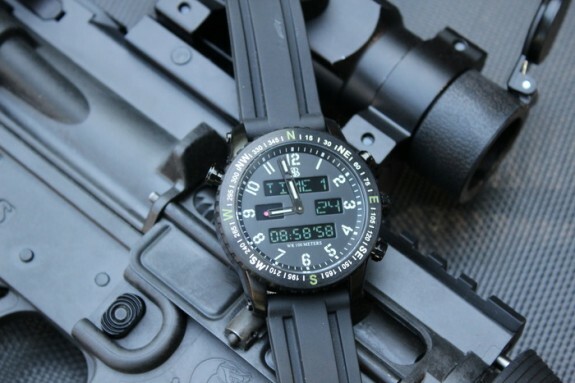 Check out the Smith & Bradley Ambush Digital Analog Watch Kickstarter campaign.